One of the best Green Arrow stories told is finally discussed on the Source Material Podcast! 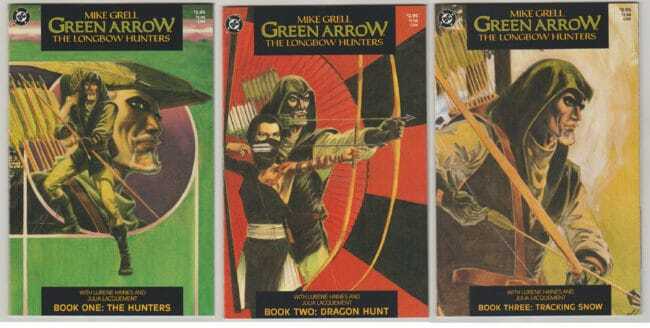 Mark Radulich, Ronnie Adams, and Jesse Starcher look at Mike Grell’s story about an Oliver Queen that moves and thinks about getting back to basics and maybe even settling down. Unfortunately, Seattle is in the midst of dealing with a killer and drug problem that may need some attention. Not to mention, the Robin Hood killer that is also making the news. Join us, as we talk The Longbow Hunters! Source Material is a comic book podcast that discusses some of the great and sometimes not-so-great comic book story arcs that have been published. Usually hosted by Jesse Starcher and his good friend Ronnie Adams. They bring on a multitude of guests to talk comic book storylines. Sort of like a book of the month club, but with comics. They also throw a dash of current events in every once in a while. Or just shoot the breeze with some of their “BS” episodes. Just trying to keep it casual and fun. Podcasts are one of the greatest mediums ever. 10 years ago Jesse found myself driving back and forth to work with over an hour of travel time. Talk radio became something that he enjoyed and helped kill time during the commute. The problem was NPR never stayed completely interesting and his only other options were the ESPN network and the local channel that hosted religious programming. Always the same show... at the same time. It was pretty limited. About three years ago he discovered Podcasts and it changed how he spent much of his time. It opened up options to great niche content that he never even knew was available. After that, he got his first podcast gig on the From the Cheap Seats sports podcast with Jayson Teasley and became a co-host shortly after that. His real passion however was comics. He managed to talk Mark Radulich into letting him do the network's premier comic book podcast Source Material. This would give him a platform to chat with friends about one of his favorite hobbies. A tremendous opportunity. Also, recently Jesse has worked his way into becoming the third co-host, alongside Mark Radulich and Robert Cooper, of the metal Hammer of Doom podcast. He loves music and a podcast about heavy-metal right up his alley.